The Associated Press reports that Japanese researchers are hard at work on new ways for users to interact with virtual worlds such as Second Life. Some of these raise the possibility of long-distance assault and battery claims. One technology involves a user moving across a large mat with specially coded patterns on it. As the user moves across the mat, the system tracks all movements and reflects them in the on-screen avatar. Not simply limited to the basic “forward, backward, left, right,” the system can also process vertical distance and tilt. To demonstrate this ability, the researcher crouched down on the mat to peer under a virtual parked car. Accordingly, the on-screen image swerved to show what the avatar would “see” — the vehicle’s underside. 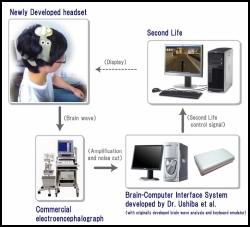 Another technology monitors brain activity (.pdf, via Keio University), so players can make their avatars move just by thinking of commands like forward, right or left. The interface uses electrodes attached to the user’s scalp to sense activity in the brain’s sensory-motor cortex. The brain activity is then translated into signals that control the avatar. When these technologies, particularly the first, are eventually paired with “force feedback” devices, such as a recently released vest which lets users “get pounded with body slams, crushed with G-forces, and blasted with bullet fire,” science fiction questions of real-life battery (requiring contact) arising from virtual world interactions move a bit closer to reality. From a health perspective, I do applaud any idea that gets users up off their seats and burning calories walking around the room. On the other hand, the brain interface makes even those pesky hand movements unnecessary. Quite a coup for the lazy gamer. On a final note, they’d better do a lot more testing before this blogger straps any sort of electrode to his scalp! Kenan Farrell is an intellectual property attorney who recently moved to San Francisco from Indianapolis. He is a member of the U.S. Patent Bar and past chairman of the Indianapolis Bar Association’s Intellectual Property Executive Board. Please join me in welcoming VB’s newest writer, Kenan Farrell. Kenan plans to write for the site periodically going forward, and I could not be happier about it. Look for a longer article from Kenan next week. Although it is an interesting idea, it seems likely that owners of force feedback devices will be able to set their preferred impact or energy level, much as we do with screen brightness, stereo sound, and so on. In that event, someone feeling they had actually been battered would be someone who had set their feedback sliders too high, and could have been harmed by a pat on the back. The whole suite of sensor items sounds intriguing; we’d all like to be able to move through our virtual worlds in a more intuitive manner. This is all a little facetious, of course, but there’s actually a doctrine (called the “eggshell skull” rule) in tort law that says that if you do something that hurts someone else and they suffer an unusually high amount of damage due to some odd personal circumstance (usually a preexisting medical condition) you can be held liable for that damage even if you didn’t know about the strange circumstances. It’s not exactly a guaranteed winner of an argument, but I can see somebody using it to bring suit in the situation you described. I suppose deciding between “reasonable care” and “eggshell skull” is some of what keeps the courts busy, eh? Does this apply when the injured party has control of the circumstances, at least in part? I could see that going either way — on the one hand, you could argue that it’s a form of consent, on the other, the rule hasn’t, so far, contemplated how the situation came about — if somebody broke their leg jumping drunk into an empty pool, but then that break was aggravated the next day by a reckless driver, the driver doesn’t get to point to the previous stupidity to get out of the extra liability. This is, believe it or not, exactly what keeps courts busy. First thing – when I saw ‘battery’, I thought you were referring to a power cell. It almost worked, too. Batteries are a very hot topic (I must have forgotten where I was). Neither technology allows feedback, so… these are things which probably wouldn’t allow for ‘assault and battery’. However, in conjunction with other technologies, it is quite possible. And I’m also dealing with some EEG related stuff – mainly with biomedical level support (it might pay the bills), and it is quite interesting how common EEG is. 20 years ago (wow) I knew someone who did that sort of stuff in Texas. Really interesting, but it was all very much ‘black box’ theory. So – when I consider that, and I consider that not everyone’s brain operates the same and that the market will dictate how EEG will be translated based on the majority – I also see the potential for other Law issues which would revolve around discrimination. It gets pretty complicated pretty fast.